Did it look like the photo/drawing on the pattern envelope once you were done sewing with it? The instructions were very easy that I was able to whip up the second one in no time. What did you particularly like or dislike about the pattern? Initially, the dress caught my eye, but once I worked it up I realized I would prefer it as a top to match a pair of navy blue slacks. 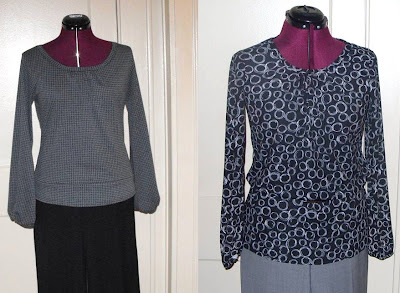 Pattern Alterations or any design changes you made: I didn't use the sleeve band and used ¼” clear elastic to gather sleeve hems. I can be such a button-head at times. I’d mentioned previously that the dress caught my eyes and cut the pattern for the dress and only after constructing the dress that I decided I really wanted it as a top to go with navy slacks. Well in a rush to do it, I hacked off the bottom of the dress and lo & behold put the top on and it was a tad bit too short. I must admit it did not deter me from wearing it to work, I just opted to wear it tucked in and thought all was good, BUT throughout the day I spent the better part of the day constantly tucking the top into my slacks. Of course, I had to bust a ghetto move and kindly retrieve the part I had cut-off and with no shame in my game reattached it and proceeded to tweak it for the right length. So in the end I ended up with a drop yoke top. :] The second time around I did it right, but kept more length and wore a belt with it and also kept it longer just in case I wanted to wear leggings with it. Would you sew it again? Would you recommend it to others? Would I sew it again, most definitely, I am in the process of making a third one. I love the simplicity of it and although I normally shy away from gathered tops, the gathering on this top is not too much and I don’t feel like Dolly Parton….lol I would highly recommend this pattern, its so addictive. Cut and serge and its complete… well not that fast but its definitely a quick project. Conclusion: I would like to try the jacket and hope to get fabric for it this week. Too cute, I really like the look of the rescued portion, no one would know it wasn't intentional if you didn't tell. I tried to post about your DD but forgot my password (DUH)but didn't I say she could be ANTM, she's very pretty. You got a whole mini wardrobe from one pattern. How Great! Looks nice too. Nice job!!!! Both tops look great. Girl, you know you worked that pattern! Great looking tops. I love all the styles on that pattern. So retro and cool! LOL! Button head? You crack me up! I've been eyeing this pattern. I'm glad you tried it. It looks great and I can't wait to see the jacket you make! Wonderful, as always. how long have you been sewing. I am just wondering if I have any hope of getting this good at it!